Turtles, Pot of Gold, Black Magic—chocolates my parents receive as Christmas presents. My mom stores Christmas ornaments in the empty boxes. Tree hooks in a Laura Secord box. Tinsel in a Godiva box. The tinsel smells like truffles. I open an After Eight box. There are candy canes inside. They’re flecked with white—it’s either mould or fake snow. These canes aren’t for eating, they’re for hanging. “How long have we had these? ” I ask. Barley water, cream of tartar, water, refined sugar cane. Combine, cook on high heat. This is how barley sugar’s made. It’s stickier than it sounds. Cooked too long, barley sugar caramelizes. Starch in barley water can make candy impossible to pull. In the nineteenth century, Canadians bought barley sugar from confectioners. Tree jewellery, bracelets for branches. Barley sugar bracelets weren’t as cheap as barley sugar twists. Hudson’s Bay stores sold the twists for pennies apiece. Eaton’s did too. Everyone did. Also available: barley sugar shaped like horses and other animals. These “hung by the neck,” as one writer put it. From confectioners in England came barley sugar fishes. Barley sugar has a short shelf life. Moisture in the air makes it lumpy. A waterlogged sugar fish? Who wants to eat that? Confectioners substituted corn syrup for cream of tartar. Barley candy, the concoction’s called. It’s harder than most hard candy. Barley alters surface tension. Candy lasts longer. Hours of licking and sucking. In the late eighteen-hundreds, Atlantic Canadian candy makers worked barley candy into moulds—Santas, reindeer, trains. Barley toys, they’re called. Another name for them was clear toys. Robertson works from a factory tucked behind a residence on Charles Street, in Truro, Nova Scotia. In 1977, he bought it from the company’s founder—his father, William Christie. W.C.—as William Christie was known—trained with confectioners in Halifax and Hantsport before striking out on his own, in 1928. W.C. amassed moulds—two-piece moulds—thousands of them. Small moulds shaped like Santas, reindeer. Larger moulds made steeds and trains, a ship complete with sails and rigging. It took pounds of barley candy to pack. Roy Robertson still uses his dad’s moulds. “Some as old as 150 years,” Robertson told Saltscapes, “and I wouldn’t part with any of the big ones.” Robertson boils his candy ingredients, then ladles the molten mixture into chilled moulds. It cools into toys. He removes them, trims their edges, packs them in plastic bags. Candies made from large moulds sell at fairs and bazaars. Some aren’t for sale. Some are for display only. And the rest of Canada? The rest of Canada has candy canes. A choirmaster created candy canes. He worked at the cathedral in Cologne, Germany, in the seventeenth century. His choristers included children, who chatted during the Living Creche. He gave them white sugar sticks. He curved the sticks into shepherds’ staffs. Candy crooks. The first candy canes—pacifiers doubling as props. Wooster, Ohio, 1847, was where and when candy canes made their first documented North American debut. I learned this from the National Confectioners Association, in the United States. In Wooster, a German-Swedish immigrant decorated his Christmas tree with white candy canes and paper ornaments. Locals noticed. How could they not? Finally, a candy that didn’t need a hook or a ribbon or a string to hang it from a tree. “Don’t forget candy canes for the Christmas tree,” wrote an anonymous columnist in the Montreal Gazette, in the early nineteen-hundreds. Candy canes had spread across Canada. Candy canes had become peppermint. No one knows who first flavoured them, not even the National Confectioners Association. Candy canes had become coloured—white with scarlet stripes. No one knows who first added red. Did red represent Christ’s blood? Was white purity? This story still circulates. A Christian magazine recently investigated it, but found no connection between the colour of candy canes and the story of Christ. My theory? 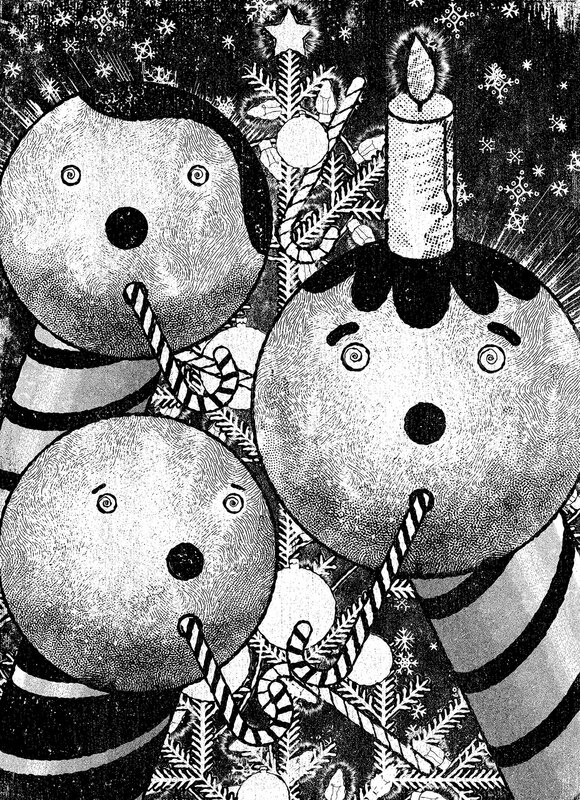 Candy canes became popular in the early nineteen-hundreds, at around the same time that magazine ads and illustrations began depicting Santa Claus in a red and white suit. Candy canes—Santa’s colour–co-ordinated accessories. In the nineteenth century, “Canada developed a thriving regional penny candy industry, with small family-owned operations filling glass jars at the corner shop,” wrote David Carr in Candymaking in Canada. An example—Robertson’s Candy. Another—James and Gilbert Ganong established a general store in St. Stephen, New Brunswick, in 1873. The Ganongs sold hard candy made in Saint John, but the candy was less than quality. The Ganongs shipped in candy from the States. Import taxes made the candy too expensive. The Ganongs became candy makers. In the early twentieth century, the Ganongs employed three hundred regular staff members. After Labour Day, it added four hundred seasonal workers. “Inside the factory the scene was a cross between a fantasyland and something out of Dickens,” wrote David Folster in his book The Chocolate Ganongs of St. Stephen, New Brunswick, describing the Christmas production rush. The Dickens part—long hours, little pay. The fantasy part—I’m not sure. What’s fantastic about a Dickensian factory? A team of master candy makers made chicken bones and lozenges. Chicken bones consist of unsweetened chocolate wrapped in cinnamon candy. Three boys and a man made nothing but barley toys. Six master candy makers concentrated on ribbon candy. Another six master candy makers concentrated on candy canes. They stirred molten sugar by hand. Pulled cooling sugar by hand. Applied a coat of red candy by hand. Twisted it until scarlet swirled through white. Hand-rolled taffy into a pole. Cut it into sticks. Two or three thousand sticks, needing crooking. A C.P.R. line ran through St. Stephen, bringing in barrels of white sugar, glucose by the cask. Carrying out Ganong candy canes to stores across Canada. Stores hung candy canes from wires strung throughout the store, or stood them in glass jars. Heat melted hard candy into a lump. Cold cracked it. Humidity made it gummy. Colour bled. Air made it stale. Age made it fade. Candy canes needed to be eaten tout de suite. The quote comes from a history of Bobs Candies. Bob McCormack founded his candy company in Georgia in 1919. He made candy canes as Christmas gifts for his kids. In 1950, McCormack’s brother-in-law, Father Harding Keller, invented an automatic candy-cane maker, a machine that twisted strips of red and white candy into sticks. Later, it could crook the ends. “The Keller Machine revolutionized the stick candy market,” says Bobs. Keller’s wasn’t the only revolutionary contraption. By the nineteen-fifties, candy companies like Bobs could seal candy in plastic wrapping. Or vacuum-pack it. Break-proof packaging kept candy from shattering during shipping. Candy could sit on shelves without spoiling. Air conditioning units cooled both plants and stores. Canada’s candy capital is Hamilton, Ontario, home of the Cadbury Adams Trebor Allan factory. Workers crank out a hundred and fifty million candy canes annually, give or take ten or twenty thousand. It’s gold. Or goldish—a warm brown, really—sucrose and glucose cooking in copper kettles. The steaming sugar’s poured onto a steel table cooled by cold water pouring through pipes beneath the tabletop. Men in gloves knead the taffy. Kneading keeps candy from splintering, and gloves keep fingernails from falling in. Men toss the taffy into a pulling machine. Paddles pull, poke, twist. Oxygen infiltrates. As it’s pulled, gold sugar whitens. When it’s white, men add red candy. The taffy’s put into a machine called a roller. The roller rolls the lump into a lengthy rope. Then the rope’s spun to a predetermined diameter: an inch, half an inch, a quarter. A machine cuts the rope into pieces. A machine loops the tops of the pieces. A machine seals them in plastic wrapping. Candy cane production continues here all day and all night, every week of the year. From other floors come other Christmas candies—chocolate Santas, marshmallow puffs. For Valentine’s Day—cinnamon hearts. An army of chocolate Easter bunnies awaits spring.